Wherever you go in Newfoundland there are beautiful sites. But in one area you'll find there's a little bit more. Green Bay is full of places to see and things to do, especially Miles Cove. This area must be visited to comprehend the value of Newfoundland. 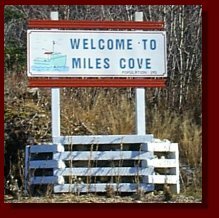 Come and experience the Beauty and Culture of Miles Cove, Newfoundland. Need More Info, Just Ask. This page has been visited times since September 19th, 1998. Copyright � 1998, Island Interactive Webdesigns, All Rights Reserved. Site maintained by : Jonathan Reid, President of Island Interactive Webdesigns.